Sometimes an encouraging word is like salt, not salve, on a wound. 1. The festive crowd that celebrated his entry on a little foal into Jerusalem for the Passover holiday. The people in that crowd were overjoyed, at least for a short time, because they snapped to the fact that the prophet Zechariah had proclaimed that their savior/king would ride into town on a donkey. 2. Then there was the mob, comprising some of those same people who had laid palms in Jesus’ path and boogied in the streets with joy over him. Now they wanted Pontius Pilate to go all Mel Gibson on him. 3. The third crowd — many mourning women among them — were those who followed Jesus as he bore his cross (with a little help from a good-hearted African). It was those women, God bless em, who gave Jesus what we all need when we’re at our lowest, most painful points in life. They gave him the gift of their presence. 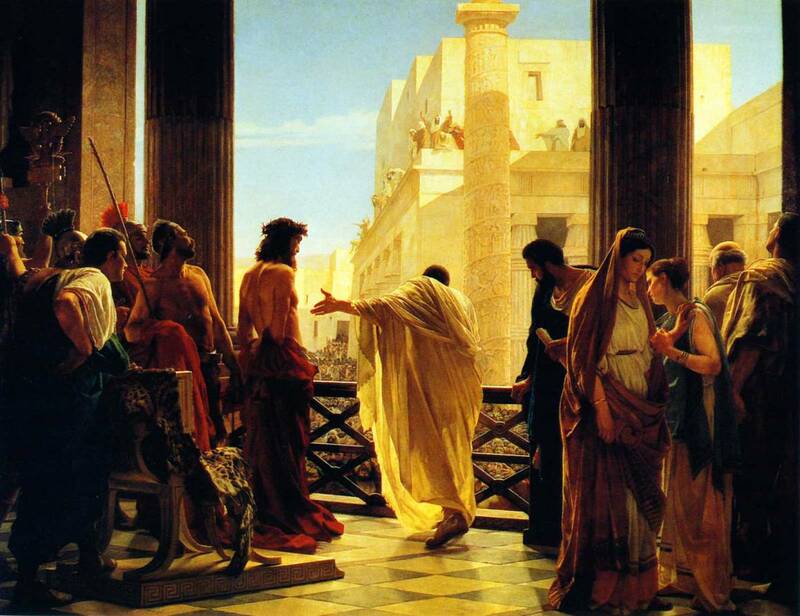 Image: Antonio Ciseri’s 1871 depiction of Pontius Pilate presenting a scourged Christ to one of the 3 crowds. And therein lies a pastoral-care lesson in Luke’s gripping account of the Passion. Even when they followed him at a distance, Jesus knew the women were there for him. 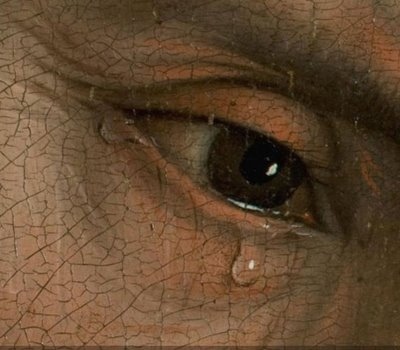 In all his anguish, he could feel their loving presence. It’s a wonderfully pleasant thing to be with someone we love on a happy, festive occasion like a wedding or birthday or Christmas bash. Not so easy simply to be there when someone is laid low by grief. We want to speak platitudes at them in futile attempts to make them feel better. If you really love and care deeply about someone, allow them to feel and express their inescapable pain. Allow them to say what they want to say to get their pain off their chest without jumping in with an encouraging word or two or 50. Like those women in mourning who followed Jesus all the way to the cross — and let him do what little, meaningful talking he did to them without talking back — just be there to share the pain. Also: “God must have needed another angel.” The intention, one supposes, is good, but the end result can ultimately shake someone’s faith in a loving God. As Rabbi Harold Kushner wrote in his book, bad things happen to good people, and they often defy explanation. Sometimes the hardest thing is saying less, rather than more, and simply, as you write, being there for someone in their time of grief. “God must have needed another angel” or “”needed another flower in his garden.” Those are the worst! Good to hear from you, Boll.